Picture yourself traveling to a neighboring town to share your faith with those living there. The government is watching your every move. At a later point they break into your home and take you off for questioning. They demand that you provide the name of your pastor, the people you worship with and the location of your church gathering. Because you choose to withhold this information you are beaten bloody head to toe. Your captors place your legs in chains and demand that you walk the floor all night long. At some point you realize that your wounds have left a bloody trail below you. Following the interrogation, you are imprisoned for three months. After your release, you begin sharing your faith with others. Soon the government detains, interrogates and imprisons you again for three years. Once released, you begin sharing your faith, find yourself detained, interrogated and imprisoned for yet another three years. This is the self-described life of Sarah Liu when speaking at a Voice of the Martyrs Advance Conference. Sarah, a wonderful Christian living in Communist China was subjected to this horrendous treatment by her government repeatedly. Like many other Christians around the world Sarah has been the object of extreme persecution. Why? She shared her faith in Christ with others. One need only to stroll the halls of a hospital to realize that troubles follow us from birth to grave. Therefore, in a general sense, we all suffer one form of tribulation or another. Yet the tribulation Jesus speaks of is not simply the common suffering or trials most of us encounter daily. Rather, He is referring to the sort of challenges unique to those who faithfully embrace Him and His teachings, and strive to live them out in a world opposed to it. For some, persecution may be mild in nature. For others, such as Sarah, persecution may be harsh and oppressive. Regardless of the sort of challenges we may face, for those of us who have embraced Christ as Lord and Savior, it is wonderful to know that we need not face them alone. Many of us have very close family and friends who care a great deal for us and would do anything within their power to help us, but they must sleep, bath and eat at some point. Their attentiveness is limited. The Lord is continuously keeping watch over us. The passage does not say that He hears our “cry” at times. It does not say that when He is available He hears our “cry.” Rather, it says, “His ears are open to their cry.” The Lord always hears our cry! In the dark of night, in the most desolate of places, when others depart or turn against us, the Lord is attentive to our cry. In Hebrews 13:5 scripture reinforces the teaching of Deuteronomy 31:6 where it says that the Lord will “I will never leave you nor forsake you.” What a reassuring thought. The God of gods, the King of kings, our Creator and sustainer, is there for us regardless of the situation. Today we hear all sorts of pledges by various business and services claiming to deliver 24/7 customer service. Personally, I have been disappointed time and time again by those making this claim. The only one who has ever delivered on this promise is God Himself! At times His deliverance is immediate and in the manner we seek. In his book “The Forbidden Stories,” Dr. Mike Ansari shares hundreds of accounts of Iranians calling into his ministry, Mohabat TV, seeking prayer for physical healing from all sorts of illnesses and life threatening diseases. Over and over again, the Lord provides deliverance. Many of the people who called Mohabat were not Christians and God used their physical needs to remedy their spiritual needs. Many of the people “stumbled” across Mohabat TV during their time of need. Living in a nation where embracing Christ as the Son of God is a serious crime, makes belief in Him a very serious and truly life changing decision. As a result, God has clearly demonstrated His miraculous healing power to underscore the validity of His reality and presence in their lives. When we find ourselves seeking immediate deliverance, it is important to note that the Lord does not always deliver us immediately. During His earthly ministry many sought immediate healing from the Lord, but clearly He did not heal everyone. There are various reasons for this, too many to discuss here. For those who are interested in this subject consider reading the book Barriers and Bridges: A Biblical Guide to Understanding Impairments, Afflictions, and Suffering within Today’s World written by George Burgess. The Son of God sought immediate deliverance from the terrible events that would soon unfold. He cried out to the Father three times. His Father did not provide immediate deliverance. Why? It was not in accord with His will. God the Father insisted that His beloved Son embrace the cruel path He had set before Him and withheld immediate deliverance from the cross. In doing so, the Father, through His Son’s sacrifice, provided ultimate deliverance for all who trust by faith in the finished work of Christ on the cross and His literal bodily resurrection from the dead. Scripture does not sugar coat the situation we find ourselves in. Rather it says, “Many are the afflictions of the righteous.” As in the case of His Son, the vast majority of afflictions we will encounter, the Lord will not deliver us from immediately. This of course does not mean that we will not be delivered. We humans struggle to stay in this fallen world residing in decaying bodies. Far too often when we think of deliverance, we view it as that which sustains and keeps us in this world. Our limited understanding of the blessing God has awaiting us causes us to fight and hang onto the inferior rather than gladly embracing the superior. The apostle Paul put things in perspective in Philippians 1:21 where he said, “For to me, to live is Christ, and to die is gain.” The apostle truly understood the meaning of deliverance, and it was not an issue of sustaining his current physical, medical, emotional and psychological standing. Rather, it was embracing the eternal blessing God had prepared for him. Apart from the Lord’s return, each of us will face physical decline and death. As we walk through the valley of the shadow of death, let us strive to join heart and hand with the Psalmist saying, “I will fear no evil: for thou art with me.” Will the journey for many of us be easy? No. Sin has tainted everything including passage from this world to the next. Therefore, as our family and friends make their final steps in this world, let us stand beside them seeking to support them in their hour of need. And for those who are truly trusting in Christ, pray for God’s assurance in their hearts of the ultimate deliverance He has awaiting them. As Revelation 21:4 says, one day there “shall be no more death, nor sorrow, nor crying. There shall be no more pain, for the former things have passed away.” Persecution and tribulation will be no more! What a blessing of blessings! Deliverance of deliverance! Praise be to God for His ministry of deliverance in our lives! He has reached down into the mire of this world, picked us up out of the filth of our own personal hopelessness and sin, and provides us with a new beginning. How do we respond to such a great gift? We join hands with the Lord in taking part in the ministry of deliverance. From Christ’s perspective, it was not enough for His followers to embrace His teachings, rather, He commanded them to embrace the ministry of deliverance as well. Undoubtedly, all Christ’s followers are called to the ministry of deliverance. All are called to live a life worthy of being called a follow of Jesus Christ. All are called to share the gospel with those around them in a loving and balanced manner. Some of us are called to go to the ends of the earth physically, but most of us will not. Yet, within reasonable means, based on the Lord’s provision, all of use can use a portion of our provisions to help those, help others either engage in the ministry of deliverance. We can likewise strive to help provide for the needs of the delivered who face persecution and tribulation daily because of their faith in Christ. We can engage in prayer for those around the world, as prayer is an essential part of the ministry of deliverance. Those facing persecution from their governments,cultures, other religions, or families need our prayer support. Some of us may have little to offer in terms of our physical or financial presence in the lives of the persecuted, but all of us can afford time to support them in prayer. One need not spend hours in prayer, but we can certainly afford a few minutes a day to lift up the needs of one person, church or nation. The Lord did not deliver us simply for us to remain dry and unproductive. Consider and commit yourself to at least a few minutes a day praying for those who have yet to come to Christ and those who face terrible persecution because of their faith in Him. Prayer is essential, but giving is likewise an essential part of the ministry of deliverance. Few of us have massive amounts of money to offer to the ministry of deliverance, yet let us remember, the Lord did not point to the wealthy as his example of giving, rather He chose a lowly widow who had little, but gave everything in Luke 21:1-4. Of course we must set aside funds to support our local church, the needs of our family and care for our own daily needs, but if we are wise stewards of that which the Lord has blessed us with, Lord willing, there is room to invest in the ministry of deliverance for the persecuted church around the world. There are many ministries that we can give to that sends missionaries to foreign lands or helps support the ministries already established within those places. One ministry that focuses specifically on the needs of those facing persecution daily is The Voice of the Martyrs ministry, an Inter-denominational Christian organization, dedicated to assisting persecuted Christians in places around the world. The ministry was founded in 1967 by Pastor Richard Wurmbrand, who was imprisoned 14 years in Communist Romania for his faith in the Lord Jesus Christ. For those of us who continue to be blessed by the freedom to worship as we please, and are in the position to give a little or a lot, please consider supporting the ministry of deliverance with The Voice of the Martyrs ministry. Please consider helping them help wonderful brothers and sisters in Christ like Sarah Liu who has suffered so much to share the gospel with those in Communist China. 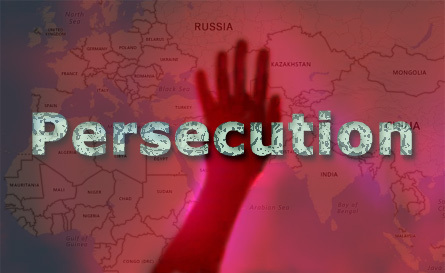 You may learn more about this very important ministry by going to persecution.com. As you consider your part and role in the ministry of deliverance for those facing persecution and great tribulation may the Lord grant you wisdom and discernment.